Schools out for Easter in Glasgow over the first 2 weeks of April. Make the most of the break with a visit to Scotland’s unique indoor/outdoor laser tag arena, at Scotkart in Cambuslang for an unforgettable laser tag experience. Brilliant fun for all the family this Easter, it can be enjoyed by kids aged 7+, teenagers and adults alike. 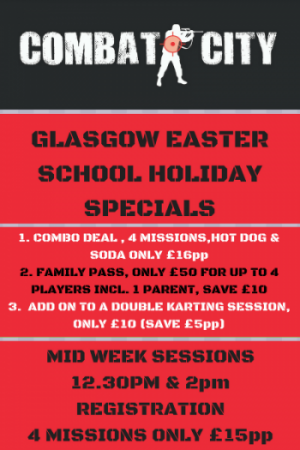 Over the Easter School Holidays in Glasgow the Combat City battlefield arena is open 7 days a week, with midweek sessions registering at 12.30pm & 2.00pm. At the weekend 60 minute sessions start every hour on Sundays, whilst in Saturdays we run 90 minute sessions at only £20pp (which these offers do not apply to). 2. Easter Holiday Combo Deal only £16pp including 60 minute session, jumbo hot dog and can of soda.